Behind The Scenes Of 'Friday Night Lights' Peter Berg, executive producer of NBC's Friday Night Lights, talks about the virtues of shooting on location, using local performers, and what the series explores that the movie couldn't. 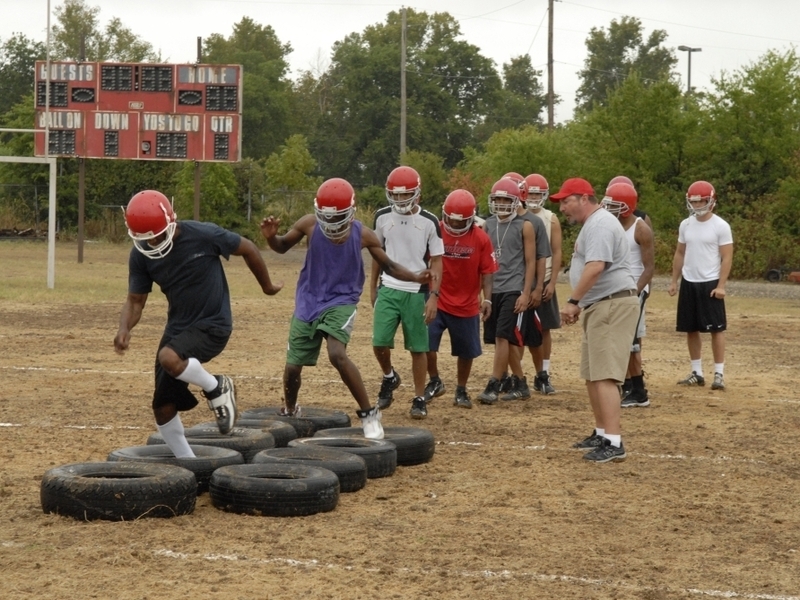 The East Dillon Lions have struggled on and off the field in the NBC/DirecTV drama Friday Night Lights. This interview was originally broadcast on April 11, 2007. Friday Night Lights will end its five-season run on Friday July 15, 2011 on NBC at 8 p.m. ET. "What Bissinger did so successfully was he used high school football as a backdrop to explore, you know, very legitimate social issues: racism, education, family values, religion. This was really the heart of Friday Night Lights, particularly issues like racism and education — those were two huge issues in the book — and I decided not to try and tackle racism as a theme in the film. I didn't think that we'd be able to service it and give it the respect and treat it with the complexity that it warrants, so we dealt with it in a much more subtle manner and decided to focus primarily on the concept of football, the concept of that one special moment in a life in which everything really seems to make sense, which is certainly a theme that Bissinger hit in his book." "During the filming of Friday Night Lights, I knew that we were not going to be able to really get deep and scratch — in a real substantive way — the surface of what Bissinger was able to do so well in the book. I felt very, very strongly that the medium of television would provide us the opportunity to do that, to take six or seven episodes and explore the ways that high schools allocate their resources financially. In Texas, the training departments, the sports medicine departments, have larger budgets than English departments, and these were themes that we weren't able to really deal with in a way that was satisfying to me or Bissinger in the film. But we felt that a television series would be a perfect medium to get deeper into these issues. And I've been very happy with the way things have worked out so far." "We had to shoot the show in Texas. It's just too unique of a culture, and the network was very supportive of it. We didn't want to build any sets, and we haven't. Actually, that's not true. We built a locker room, but other than that, we shoot the show entirely in real locations with as many Texas actors as we can. We wanted to avoid bad Southern accents wherever possible, and I think that putting the show in Texas was and is a critical aspect to why this show is working creatively." "We generally walk into a location that's a real location, so if we're shooting in a restaurant, we just take a regular restaurant the way it is, the way it's lit. We'll generally approach the restaurant a day before and tell them if they have regular clientele that come and want to hang out for a day, be part of a show, that they should just come. "We hire ... the local cooks, local waitresses in their costumes. We tend to not dress them. We bring the actors in with a minimal amount of equipment, you know: grip equipment, rigging and lighting. We let them kind of walk around rehearsing the scene. We encourage them to improvise and make the dialogue their own, change things. We don't call them scripts. We tend to call them vague guidelines. "Then we come in with a bunch of handheld cameras, and we tell everyone to just sort of go, and it's over very quickly. And for people that aren't used to it, it's somewhat traumatic and they wonder kind of what happened when we say, 'OK, we got it,' and we move on to the next location."